You have heard the old saying “great minds think alike.” St. John’s has begun a collaboration with Catawba College to provide interesting speakers on a variety of continuing education topics in some of St. John’s very desirable venues. This collaboration promises to offer members of St. John’s and members of the Rowan-Salisbury community greater access and opportunities to attend to these programs. The first program in the collaboration is a Community Forum entitled “The Picture Man and a Conversation about the Ways We Keep Our Stories,” scheduled for 10 am on Tuesday, April 9 in the Faith Center. Author Julia Ebel, a Catawba College alumna, Class of 1972, will talk about her book, The Picture Man. During the late 19th and early 20th centuries, these traveling photographers moved through rural areas and small towns in North Carolina sometimes with a cadre of props, taking pictures of children, families and individuals. Their work helped preserve each family’s history and in effect, each family’s stories. “I write to call out stories that bridge us to our roots, to memories of times past and persons who have nurtured us and shaped our lives,” Ebel says. She draws readers of all ages into an appreciation of history, heritage, and nature through her stories, biographies, and poems. The stories she keeps begin with the people, the culture, and the landscape of her native North Carolina. She also writes poetry, some of which appears as free verse in historical fiction and in her biography of Max Woody, a North Carolina traditional chair maker. Ebel conducts poetry and writing workshops in schools and libraries and is often tapped to present programs on keeping stories. When she is not writing, she tutors and has taught children’s literature and language classes at Guilford Technical Community College. 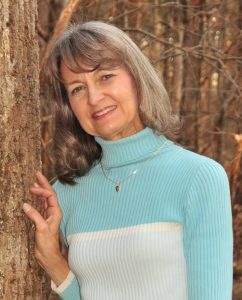 Although she makes her home in Jamestown with her husband, son, and beloved golden retriever, she notes that part of her heart is in the North Carolina Mountains where she finds inspiration for much of her writing. St. John’s will provide coffee and water in Peeler Hall at 9:30 am before the 10 am program. Ebel, who has developed a study guide for “The Picture Man,” will share the importance of preserving a family’s history and some ways to do that through fun, collaborative, multi-generational activities such as making a pinhole camera from a shoebox. She will also have copies of her books for sale and will be available to sign them following her presentation. All attending are encouraged to bring along an old photograph or two. As discussion explores the importance of our own photographs, recent ones to older ones of those before us, these photographs might provide some inspiration for your own thought and personal exploration. A pen and notepad might come in handy too. As always, this April 9 Community Forum at is free and also open to members of the Rowan-Salisbury community, so be sure to invite friends to attend.